DISTANCE LEARNING: WHAT WORKS, WHAT DOESN’T Joseph Eble Burlington County College *All red text are my notes Juliet Fink, Coordinator of Instructional. 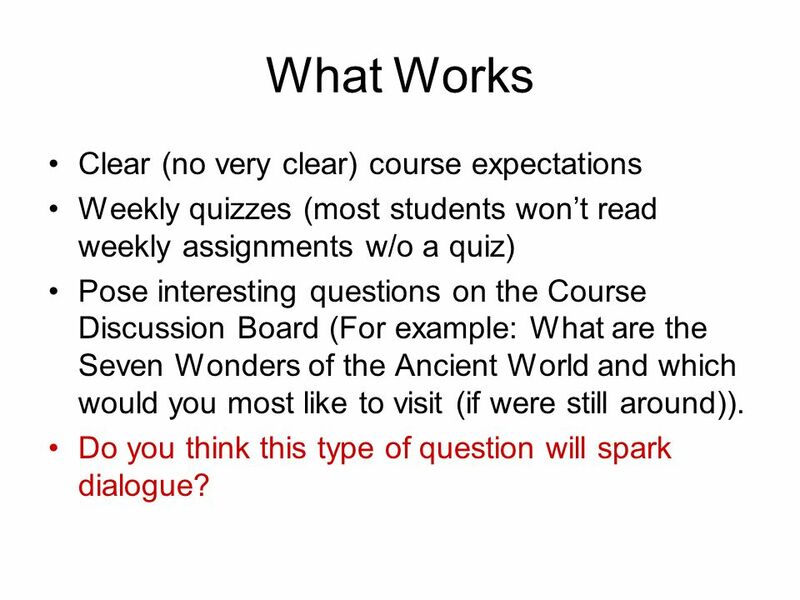 2 What Works Clear (no very clear) course expectations Weekly quizzes (most students won’t read weekly assignments w/o a quiz) Pose interesting questions on the Course Discussion Board (For example: What are the Seven Wonders of the Ancient World and which would you most like to visit (if were still around)). Do you think this type of question will spark dialogue? 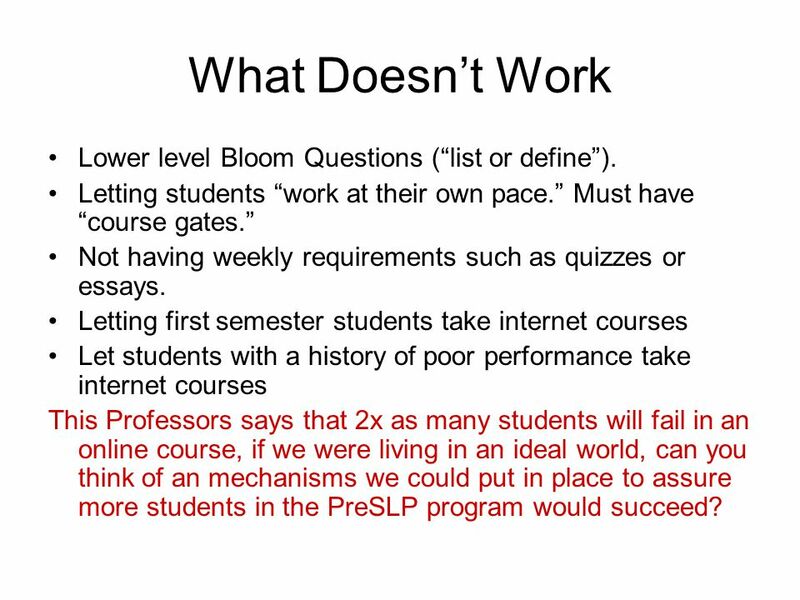 4 What Doesn’t Work Lower level Bloom Questions (“list or define”). Letting students “work at their own pace.” Must have “course gates.” Not having weekly requirements such as quizzes or essays. Letting first semester students take internet courses Let students with a history of poor performance take internet courses This Professors says that 2x as many students will fail in an online course, if we were living in an ideal world, can you think of an mechanisms we could put in place to assure more students in the PreSLP program would succeed? 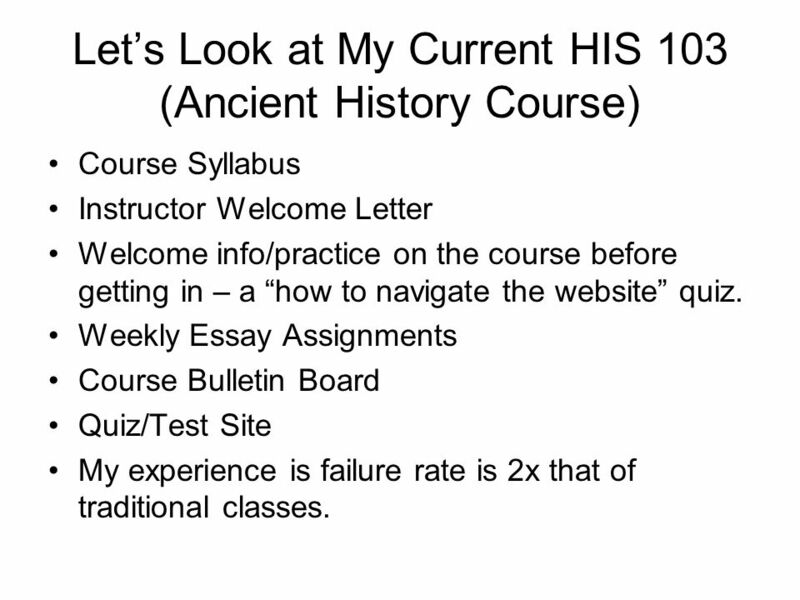 5 Let’s Look at My Current HIS 103 (Ancient History Course) Course Syllabus Instructor Welcome Letter Welcome info/practice on the course before getting in – a “how to navigate the website” quiz. Weekly Essay Assignments Course Bulletin Board Quiz/Test Site My experience is failure rate is 2x that of traditional classes. 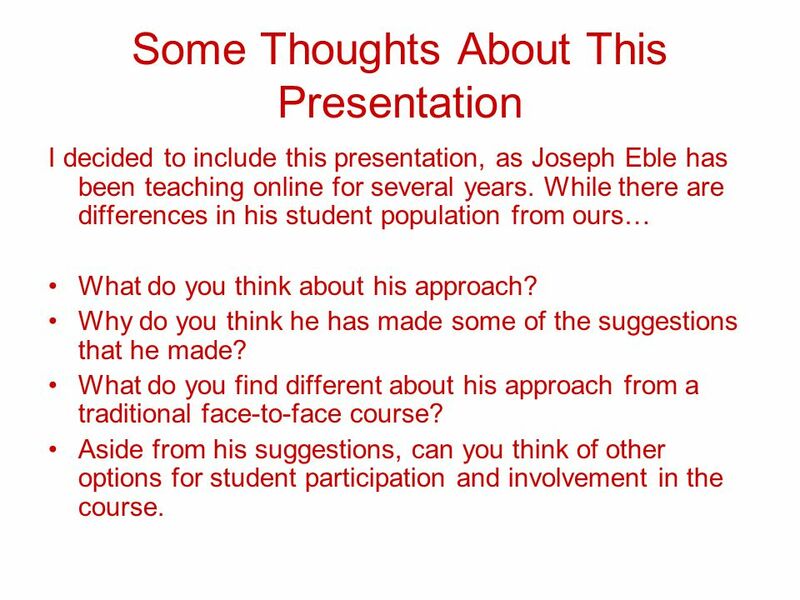 8 Some Thoughts About This Presentation I decided to include this presentation, as Joseph Eble has been teaching online for several years. While there are differences in his student population from ours… What do you think about his approach? Why do you think he has made some of the suggestions that he made? What do you find different about his approach from a traditional face-to-face course? 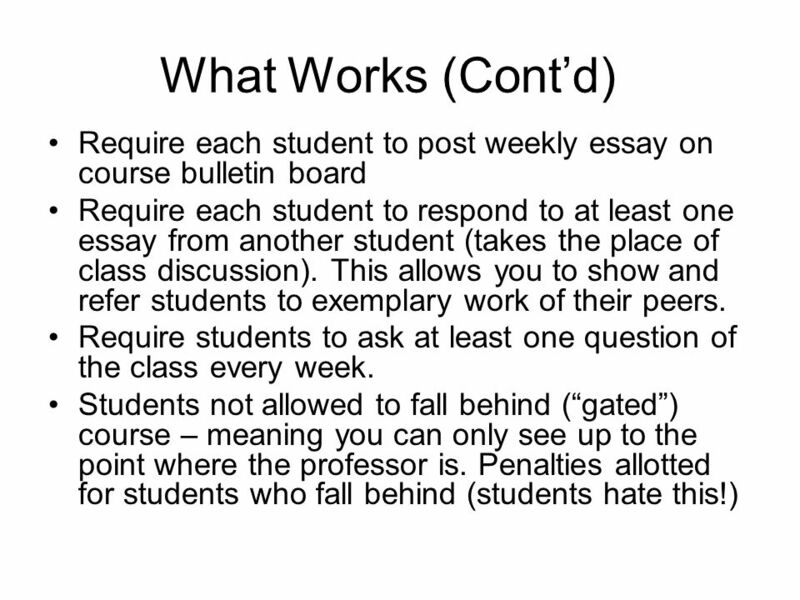 Aside from his suggestions, can you think of other options for student participation and involvement in the course. 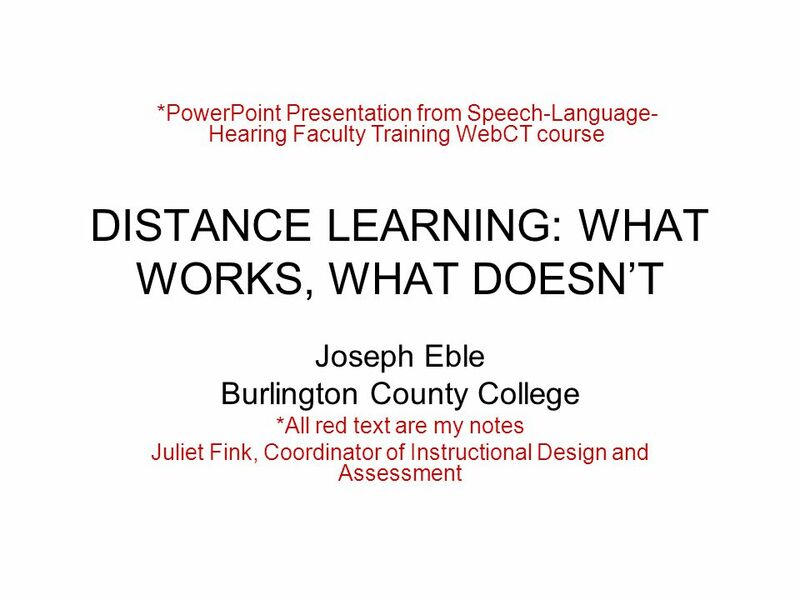 Download ppt "DISTANCE LEARNING: WHAT WORKS, WHAT DOESN’T Joseph Eble Burlington County College *All red text are my notes Juliet Fink, Coordinator of Instructional." Teachers, administrators and staff continuously seek and share learning and then act on what they learn. The goal of their actions is to enhance their. CDL Student Orientation First Time Online Student? Returning Student? Online learning that compliments face-to-face teaching. 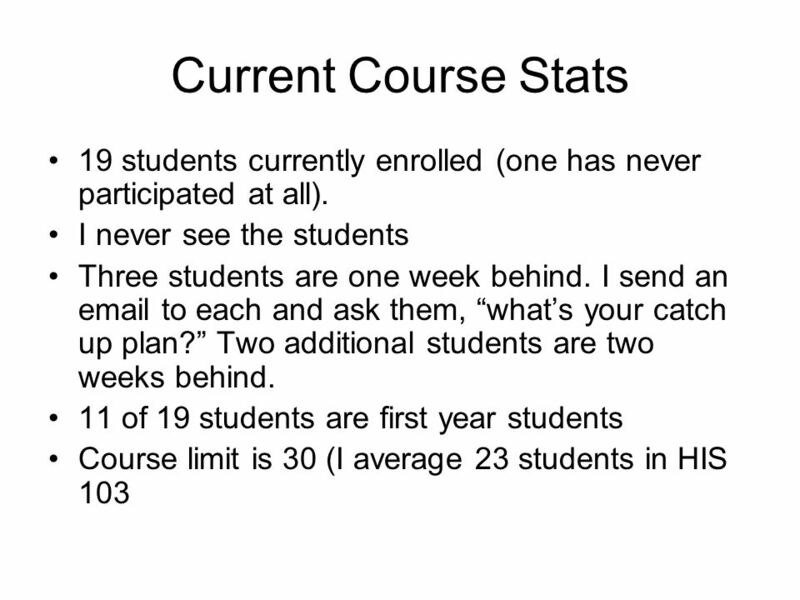 Elements of an Online Syllabus Contact: Melody Buckner Instructional Designer. Troy University eTROY Colloquium April 17-18, 2012. Online Course Development Techniques and Best Practices Online Academic Services W.P. Carey School of Business. Welcome to Marketing Strategy 626 How to use our blog: 1 You might already be an experienced blogger. Please read this anyway to learn more about our blog. Quality Matters! Using the Quality Matters Rubric to Improve Online Course Design Susan Bussmann and Sandy Johnson NMSU Quality Matters Institutional. December 17, 2014 Using MyLinE to Encourage Reading: Read and Respond Creative Teaching, Effective Learning. Welcome To Hermiston ONLINE! Orientation for the 2012/2013 School Year. Entering Students Have a Lot to Tell Us: Are We Listening? NISOD Monday, May 31, :15AM – 12:15PM Room 13A. Findings from Fall 2001 UM.CourseTools Survey Michelle Bejian, UM Media Union Findings from UM.CourseTools Satisfaction Survey Fall 2001. Classroom Conflict Prevention Developing Learning Cohesions Resources. Integrating Faculty Web Pages into Classroom Teaching Host: David A. Pierce Presenter: Paul M. Yun. Welcome to Algebra 2! Find the 3 keys to success and write them down for our welcome call. Promoting Online Student Success Andrea Henne, EdD Dean, Online & Distributed Learning. Blended classes are an exciting way to learn. Their convenience and scheduling appeals to many students, but they are not for everyone. Students drop-out. Welcome to the University of Oregon. Advising Schedule Goals for Today Overview of academics at the University of Oregon Later today… Meet with an academic. Fall 2004 WWW IS112 Prof. Dwyer Intro1: Overview and Syllabus Professor Catherine Dwyer. IPC144 An Introduction to Programming Using C. Instructor Murray Saul Office: Rm. 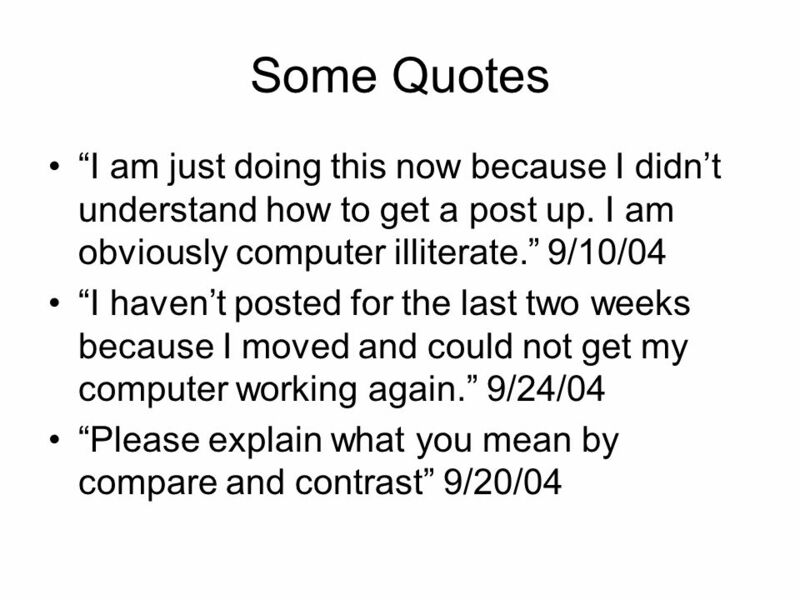 2170 –Office hours are posted on my IPC144 web page or on bulletin board.